A common question frequently asked in regards to Enterprise Architecture is the question, “What is the most important aspect to keep in mind when considering an Enterprise Architecture initiative?” The only logical answer to this question is, “That is correct! What IS the most important aspect when considering an Enterprise Architecture initiative”. That is correct. By asking the question “What?” in consideration of an Enterprise Architecture initiative, an organization can describe the foundation upon which the entire organization rests. 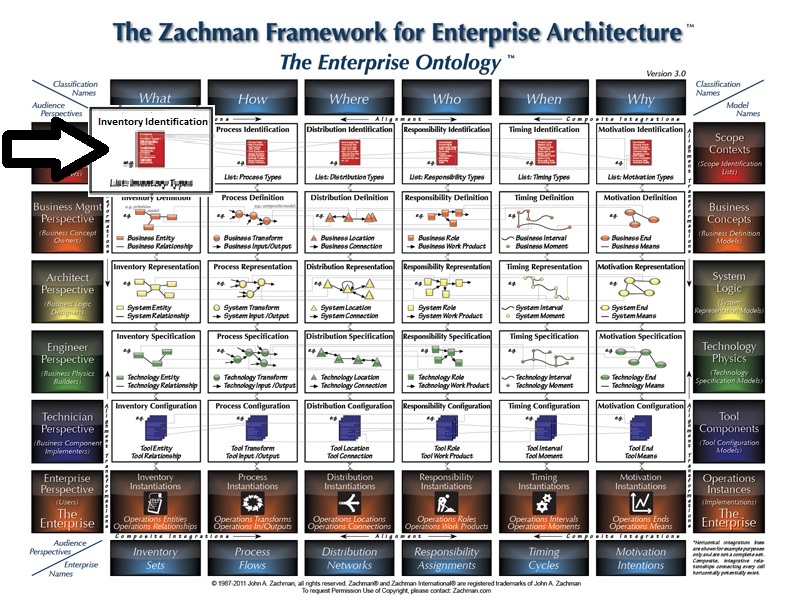 The Zachman framework for Enterprise Architecture asks the fundamental questions of What, How, Where, Who, When, and Why at various levels of the Enterprise in order to describe the Enterprise Architecture. It is no coincidence that “What” is the first question Zachman asks. Each of the other questions cannot be answered until “What” has been answered. American Widgets is an end supplier of Widgets nationwide. Widgets are produced by multiple wholesale partners and sold to customers in over 500 American Widget stores nationwide by a dedicated staff of knowledgeable associates. The nouns in the sentences are: Supplier, Widget, Partner, Customer, Store, and Associate. “Supplier” can be ignored, as in this case, supplier and American Widgets are equivalent, leaving Widget, Partner, Customer, Store, and Associate. It is from these five entities that the entire enterprise is built. Every function of the enterprise can be described as some combination of these core entities. When answering the question “What” about an organization, it is not enough to simply define the core “What”s. The core “What”s also must to be combined to form the operational “What”s that form the basis for an organization’s operating model. In order to define the operational “What”s, consider the operational pipeline for American Widgets. The widgets are procured from the manufacturing partner, placed for sale in the store, and sold to the customer. An operational “What” is derived by forming a noun that describes each item in the pipeline. For American Widgets, the items in the operational pipeline, and hence, the operational “What”s. can be described as “Procurement”, “Inventory”, and “Sales”. What is so important about “What”? By defining the top level “What”s about an organization, a large number of structural elements of the organization can be derived. When considering an organizational structure, for example, the operational “Whats” can form the basis for individual business units. The top-level “What”s can also be used to determine capability when considering strategic initiatives by referring to the top-level “What”s and ensuring that the new initiative can be described using a combination of those “What”s. Information Technology is the most obvious beneficiary. The top level “What”s can be used to define an enterprise database schema, whereas each top-level “What” could be implemented as a database or database schema within a single centralized operational database. When considering the role for application development, applications can be grouped as a function of each of the top-level “What”s. Namespaces can be defined according to these groupings, e.g. “AmericanWidgets.Customer.<AppName>” in the Microsoft realm, or in the Java realm, “com.americanwidgets.customer.<appname>”. As a result, source code repository structure would follow the same groupings. Lastly, in a Service Oriented Architecture (SOA), the core “What”s can be used to define the bottom level service layer, as all enterprise applications will need access to centralized services that handle the core “What”s of the organization.